BOOK YOUR $197 SESSION NOW! YOU’RE STRUGGLING TO GENERATE OPPORTUNITIES? UP WHEN PEOPLE ARE SEARCHING FOR WHAT YOU OFFER? REALLY SURE HOW LINKEDIN CAN HELP? CUSTOM LINKEDIN STRATEGY THAT WILL ACHIEVE THE RESULTS YOU’RE SEEKING. And you won’t be dealing with a LinkedIn novice in my office who uses a one-size-fits-all checklist to simply spruce up your profile. You’ll be talking directly with me, and we can focus on increasing sales, nonprofit growth, finding the perfect new job—literally any career or business goals you want to achieve. The majority of LinkedIn members use the free account, and that is all most people need. But if you currently have a premium account, we’ll talk about whether it’s been worth the money and if it’s the best premium option for you. I’ll also show you some secrets for making the most of the features in your upgraded account. I met Wayne at a conference a few years ago and have used his weekly tips and his book to dramatically upgrade my LI presence, and my contacts have definitely increased. I took advantage of his one-hour makeover session—that led to yet more ideas to improve my profile, plus a bonus! He helped me create a new process for generating leads from the stage. This more direct approach feels weird and new—and it worked. With a group of just 25 people, I got four speaker leads! A week later, with a similar sized group, I left with two more leads. Wayne has generated a HUGE return on my investment! Wayne is a fabulous resource for effectively using LinkedIn! He is an excellent communicator and has a very well thought-out approach to maximizing how LinkedIn can work for raising one's visibility for a job search. A session with Wayne is time well spent. Highly recommended. The biggest mistake people make is to create their profile and forget it. Your profile needs to be current and dynamic—and simple tweaks can catapult you to the top of the search rankings and get your targets to engage with you. We will brainstorm together to find the perfect keywords for you and the best places to put them on your profile so you will show up in searches and stand out from your competitors. You will learn how to clearly state what you do and how you can help people get what they want so they’ll peruse the rest of your profile and engage with you. We will discuss how to tell your unique professional story in a way that engages your audience and compels them to reach out and learn more. You will learn how to bring this section into perfect alignment with your target audience and clearly state what you do and who you can help. We will discuss where you should place media in your profile so it will pop and instantly engage your target audience. We will determine where to place calls to action in your profile that will entice your target audience to start the engagement process with you (visit your website, view a promotional video or slide show, download a white paper or checklist, etc.). You will discover how these hard-to-find optional profile sections can set you apart from your competitors or other job candidates. Your newly optimized profile will start appearing in LinkedIn searches like never before—and most of the people who find you will be directly in your target audience. You’ll have plenty of ways to spark engagement with your ideal customers, partners, and potential employers. Soon you’ll be the one killing it with LinkedIn, while others are left wondering what they’re doing wrong. Great job offer received via LinkedIn only two days after consulting with Wayne! I've also received many compliments from recruiters saying that they are impressed with my background and what they've seen on my profile…He had some great suggestions that were quick and easy to implement…He also shared some valuable step-by-step techniques for making important connections. We’ll start by discussing who you are, what you do, and where you want to go (your goals). And don’t think I can’t help you just because your business or situation is unique or unconventional. Of course, I’ve had individual sessions with all the members of large sales teams, coaches and consultants, speakers and authors, nonprofit leaders, and professional service providers. But I’ve also gotten rave reviews from a pet sitter, professional harpist, wine distributor, and even the owner of a horse transport business. A huge network is great, but you’ll be disappointed with your LinkedIn results if you don’t have enough of the right people in your network. I’ll show you how to build a network of people who need your products and services and will be anxious to recommend your goods and services to others. If you’re looking to upgrade your career, I’ll demonstrate easy ways to find and connect with people who can open the right doors for you. There are right (and wrong) ways to invite people into your network. To simplify the process, we will create a script for you to use when inviting and following up with your targets. And you’ll learn how to get people to accept your connection requests—even total strangers. Staying top of mind with your ideal prospects is vital to your business and career success. Your customers and potential employers have lots of options, so why should they choose you? Ongoing communication will increase not only your visibility but also your credibility. I will show you how to become a thought leader or go-to expert in your industry and marketplace—and this isn’t as hard as you might think. Posting status updates, sharing articles (your own and those of other experts), and using relevant hashtags and tagging can get you noticed by your prospects and show them you are willing to educate them and help them achieve their objectives. Too many people waste too much time on LinkedIn and get little or no return on their investment. During your session we will discuss exactly where you should be focusing your attention on a daily, weekly, and periodic basis to achieve the results you desire. LinkedIn gives very little training to large, corporate users and even less training to individual Sales Navigator users. Thus, most users haven’t even discovered the features of this platform that justify the monthly fee. If you’re using Sales Navigator, we will focus on the features that can make you the most money. The extensive search filters are invaluable and will help you find the perfect targets. The set-it-and-forget-it feature will notify you weekly about new people in your target market. And tracking your targets has never been easier. Finally, if Sales Navigator just isn’t worth it for you, I will show you how to do many of the same functions with the free account. My session with Wayne was so valuable. After only 11 days later, I increased my connections by 30, earned two meetings with decision-makers, and linked with C-level execs. I had a one-hour personal consultation with Wayne and discussed a specific strategy for improving my search results and increasing my LinkedIn social selling index. Wayne was helpful, encouraging and offered valuable guidance on enhancing my profile. I have also used his techniques for gaining positive profile exposure and taking advantage of the new search algorithms in the program. Most of the strategies outlined above can be applied to almost any business or career objectives, but certain business sectors have unique requirements and expectations—and professionals seeking new career opportunities have quite a few exceptional LinkedIn features available specifically for them. If you do not fall into one of the broad categories listed below, we will identify and address your specific needs during your session. Whether you’re actively and openly seeking a new position or being more discreet so your boss doesn’t find out, LinkedIn offers quite a few fantastic features and options for you. I will show you how easy it is to attract recruiters, hiring managers, and HR professionals to your profile, and you’ll learn tricks to get ultimate decision-makers to view your LinkedIn profile. We’ll discuss how you can leverage your existing network to find unposted opportunities and get the inside scoop from employees at your target companies. And if you’re over age 50, I have special tips for you. We will do actual searches for the kinds of jobs you’re seeking, and I’ll show you how to set search alerts that will deliver relevant job opportunities directly to your inbox. And we’ll go beyond LinkedIn. Many employers are using applicant tracking systems that compare your resume to the job description and automatically eliminate candidates. We’ll address how you can get past these robotic gatekeepers and improve your odds of getting an interview. LinkedIn is unmatched if you’re looking for a way to fill your pipeline with qualified prospects, close more deals, and increase your revenue. During your session you’ll learn how to quickly find and engage ideal buyers, receive qualified referrals from your network, and generate more sales in less time. We’ll do actual searches so you can see how fast and easy it is to find your perfect customers. And with LinkedIn you don’t have to do all the work yourself. I’ll lay out simple ways to attract the decision makers in your marketplace and entice them to connect with you and start a conversation about your products and services. The simplest way to get new clients is through referrals. LinkedIn makes it easy to view the networks of your current clients, find potential new clients, and then ask your clients for referrals. I’ll also show you how simple it is to build a robust network of service providers (bankers, accountants, attorneys, etc.) who will be willing to refer people to you. I have worked extensively with service providers (including financial advisors) to market their services, share content on LinkedIn, and get more business in their doors while remaining in compliance with industry regulations. LinkedIn is the perfect platform to find employees, volunteers, and board members who are passionate about your mission. And, of course, there’s fundraising. Because people like to give to people they know, I’ll show you how to uncover how your colleagues, volunteers, and board members are connected to potential corporate sponsors, major donors, and institutions. I'm a huge fan of Wayne Breitbarth! After the profile consultation and strategy session he did for me, I made the edits he recommended and my profile views skyrocketed! Wayne pushed me out of my comfort zone and helped me showcase my strengths and accomplishments. As a nonprofit leader, this has been a game-changer. Not only am I building a stronger local network of potential volunteers and supporters, I am also developing a national awareness as a thought leader in my mission area. Wayne rocks! The BOOK YOUR $197 SESSION NOW button will take you to Calendly.com, where you can enter your payment information and choose a time on my calendar that works for you. I even have some night and weekend times to work around your busy schedule. A day or two before your phone session I will email your marked up, critiqued LinkedIn profile to you, along with other helpful resources I will reference during your session. I will share my screen with you during the consultation, and a link for this will be included in the email. I will call you at your scheduled time, and during your one-hour session we will discuss what you want to accomplish with LinkedIn, specific profile revisions that will get you noticed by your target audience, and LinkedIn activities that will provide real, trackable results. After the call, simply implement my profile recommendations and execute the strategies we discussed, and then watch the LinkedIn results start to happen. There’s no better time than now to start getting the results you deserve with LinkedIn. Wayne Breitbarth is an industry leader in LinkedIn training and marketing. He has shared his expertise with more than 100,000 professionals through private business consulting, dynamic presentations to global audiences, and his critically acclaimed book The Power Formula for LinkedIn Success (now in its 4th edition). 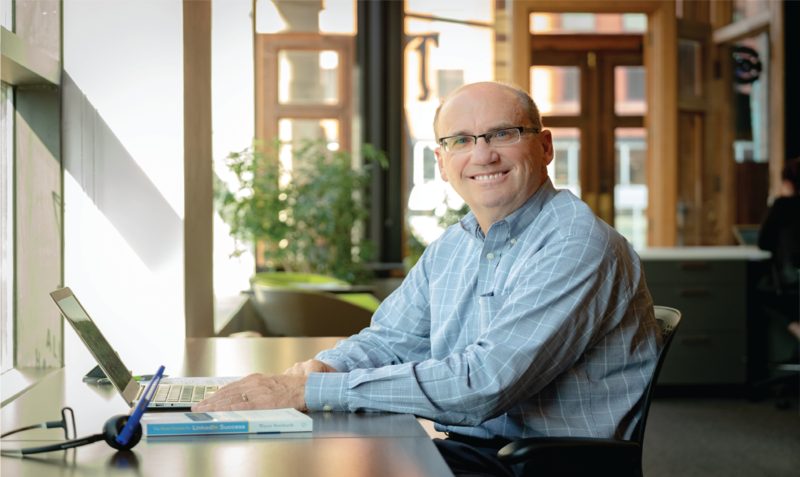 Wayne’s broad business background that includes success across many disciplines—operations, finance, human resources, management, consulting, and business ownership—makes him the perfect LinkedIn mentor for you, no matter what you’d like to accomplish with LinkedIn. Wayne has developed true expertise in the world of leveraging LinkedIn to deliver value between networked individuals. After an initial privately delivered seminar which felt more like a 12-step program than a training class (hello, my name is Jon and I'm scared of LinkedIn), many of our team members scheduled one-on-one working sessions with Wayne to help us build our profiles and proficiency as users to grow our professional presence and networks. Wayne provided excellent advice and recommendations during our recent LinkedIn consulting session. He is an expert in this area and was able to provide insights into my profile that will help me advance my brand and positioning. Wayne is an excellent listener and took a great deal of time during our session to understand my background, experience, and interests. I strongly recommend his services. I would highly recommend Wayne to any individual that is interested in increasing sales and modernizing their approach to marketing. In one hour Wayne gave me enough solid, helpful advice to keep me busy—and profitable—for months to come.